Glenn Greenwald and Bill Federici are part of a very select newspaper reporter group: journalists who have played a part in daring, real-life capers. 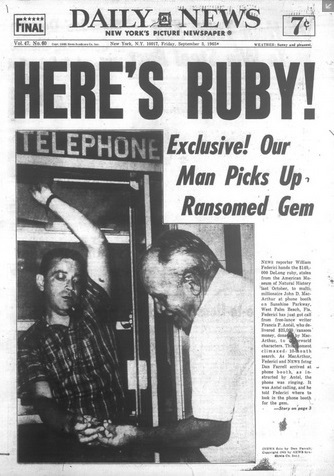 On September 3, 1965, Federici landed on the front page of the Daily News, photographed recovering the DeLong Star Ruby from a phone booth in Florida. The 100.32-carat gem was stolen on October 29, 1964 from the American Museum of Natural History by Florida surf bum Jack “Murph the Surf” Murphy and two other men. Also swiped in the heist was the famed Star of India sapphire, which was recovered in a Florida bus station locker. Later on in Hutchinson’s warm tribute article, Federici – nominated three times for the Pulitzer and a winner of a George Polk award – gets the kind of praise that really counts. 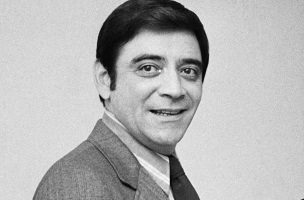 Says NYDN senior production editor James Harney: “He was every bit as good a teacher as he was a reporter.” RIP.